Bring the beauty of chant to life in your community with this prayerful collection from Benedictine Father Columba Kelly! Setting sacred prose texts to music is a task steeped in history, inherited from the ancient faith communities who spoke Hebrew, Greek and Latin. Benedictine Father Columba Kelly, director and composer for the Gregorian Schola at Saint Meinrad Archabbey, was inspired to accomplish this task for modern English texts given to us for singing the praises of God. Thus, he composed Saint Meinrad Entrance and Communion Antiphons, containing Entrance and Communion Antiphons for all the Sundays, solemnities, and feasts of the liturgical year. Chant is music designed for the unaccompanied human voice. It is sung prayer that springs from intensified speech. Fr. Columba Kelly composed the melodies for both the antiphons and the congregational refrains on the collection, and Raymond Henderson wrote the optional keyboard accompaniments as an aid to singers who are not familiar with the various chant modes or this speech-inspired style of singing. Conveniently sized to fit into the missal covers or the back pockets of OCP hymnals, parish music directors, monasteries and convents will find these antiphons can be easily incorporated into the Sunday liturgy using the simplified congregational refrain while the choir or cantor chants the antiphon or psalm. The English text settings capture the spirit of the original Latin chant. Return to this inspired collection throughout the year! Covering all the Sundays and solemnities from Lent through Holy Week, this spiral-bound edition contains accompaniment parts for 32 antiphons as well as the text for all the verses, refrains and antiphons. As Father Columba explains in the introduction, the accompaniment parts are meant to serve as a support for the pitches and to provide harmonic background for the singers and should not guide rhythm or intensity. Consider purchasing the Cantor/Keyboard edition in conjunction with the 16-song sampler CD; the recordings will be of great help when learning how to implement these beautiful chants in weekly liturgy. Covering all the Sundays and solemnities from the Second Sunday of Ordinary Time through the 17th Sunday of Ordinary Time, this spiral-bound edition contains accompaniment parts for 49 antiphons as well as the text for all the verses, refrains and antiphons. As Father Columba explains in the introduction, the accompaniment parts are meant to serve as a support for the pitches and to provide harmonic background for the singers and should not guide rhythm or intensity. Consider purchasing the 16-song sampler CD in conjunction with the Cantor/Keyboard Edition; the recordings will be of great help when learning how to implement these beautiful chants in weekly liturgy. Covering all the Sundays and solemnities from Easter through Pentecost, this spiral-bound edition contains accompaniment parts for 31 antiphons as well as the text for all the verses, refrains and antiphons. As Father Columba explains in the introduction, the accompaniment parts are meant to serve as a support for the pitches and to provide harmonic background for the singers and should not guide rhythm or intensity. Consider purchasing the 16-song sampler CD in conjunction with the Cantor/Keyboard Edition; the recordings will be of great help when learning how to implement these beautiful chants in weekly liturgy. Covering the Eighteenth Sunday through the final Sunday of Ordinary Time, this spiral-bound edition contains accompaniment parts for 55 antiphons as well as the text for all the verses, refrains and antiphons. As Father Columba explains in the introduction, the accompaniment parts are meant to serve as a support for the pitches and to provide harmonic background for the singers and should not guide rhythm or intensity. Consider purchasing the 16-song sampler CD in conjunction with the Cantor/Keyboard Edition; the recordings will be of great help when learning how to implement these beautiful chants in weekly liturgy. Covering all the Sundays and solemnities of the Advent and Christmas seasons, this spiral-bound edition contains accompaniment parts for 32 antiphons as well as the text for all the verses, refrains and antiphons. As Father Columba explains in the introduction, the accompaniment parts are meant to serve as a support for the pitches and to provide harmonic background for the singers and should not guide rhythm or intensity. Consider purchasing the Cantor/Keyboard Edition in conjunction with the 16 song CD sampler; the recordings will be of great help when learning how to implement these beautiful chants in weekly liturgy. Covering the major solemnities and the Proper of Saints, this spiral-bound edition contains accompaniment parts for 63 antiphons as well as the text for all the verses, refrains and antiphons. As Father Columba explains in the introduction, the accompaniment parts are meant to serve as a support for the pitches and to provide harmonic background for the singers and should not guide rhythm or intensity. Consider purchasing the 16-song sampler CD in conjunction with the Cantor/Keyboard Edition; the recordings will be of great help when learning how to implement these beautiful chants in weekly liturgy. Setting sacred prose to music is a task steeped in history, inherited from the ancient faith communities who spoke Hebrew, Greek and Latin. Benedictine Father Columba Kelly, director and composer for the Gregorian Schola at Saint Meinrad Archabbey, was inspired to accomplish this task for modern English texts given to us for singing the praises of God. Thus, he composed these "modal settings of Roman Missal texts in modern notation," designed to make the beauty of chant more accessible for parishes as well as monasteries, convents and seminaries. Recorded at Saint Mary's Cathedral of the Immaculate Conception in Portland, Oregon, the 16 songs on this collection are just a sampling of the hundreds of antiphons for the Sundays, solemnities and feasts of the liturgical year that appear in the assembly book. Offering a truly prayerful and meditative experience, the collection can also serve as the perfect guide for any choir or assembly seeking to incorporate these beautiful chants in the weekly liturgy. 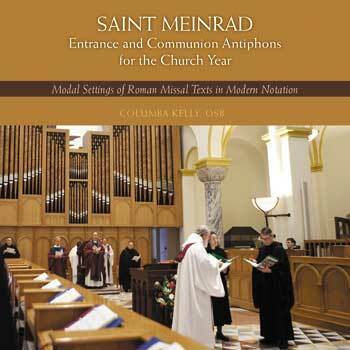 The recordings on this collection demonstrate the versatility of the antiphons as well as the congregational refrain (a short phrase sung by the assembly) and the psalm verses, showing how you can combine the different components depending on the specific celebration or your assembly's needs. Return to this inspired collection throughout the year to bring the word of God to life in a more profound way. Inspired by the ancient faith communities and a deep love for classical Gregorian chant, Benedictine Father Columba Kelly composed this series of chants for modern assemblies. By focusing on the idea that chants are simply sung prayer that springs from intensified speech, Father Kelly brings us this collection of entrance and Communion antiphons that make the serene beauty of chant more accessible for parishes, monasteries, convents and seminaries. With simplified refrains for the assembly and antiphons for the choir or cantor, the assembly books are the perfect way to incorporate these beautiful chants into the Sunday or daily liturgy. Conveniently sized to fit into missal covers or the back pockets of OCP hymnals, these small booklets will make it easy to incorporate the antiphons into your liturgies. Beautifully recorded, the examples on the CD are ideal for learning how to sing the plainsong of the antiphons, the simpler congregational refrains and the chanted psalm tones of the verses. Providing all the antiphons, psalm verses for cantor/choir and keyboard accompaniments, the six spiral-bound cantor/keyboard editions cover every Sunday, major feast days and solemnities and the Proper of Saints. The optional accompaniments by Raymond Henderson lend support for cantors and choirs, especially those new to this speech-inspired style of singing.